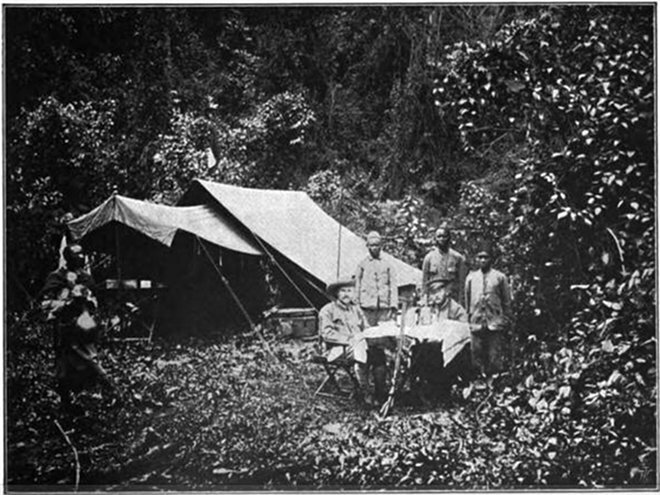 In camp in the Rugege forest, now the Nyungwe forest, showing extensive liana growth. From In the Heart of Africa, by Adolf Friedrich, Duke of Mecklenburg, published 1910, page 74. The writings of early travelers in Africa hold more than just descriptions of adventure and unspoiled wilderness. For conservationists they offer a view that can’t be seen any other way. These old writings have been overlooked for too long, writes Scholte in an Aug. 26 African Journal of Ecology article. They were once limited to patrons of well-stocked libraries. But now, as digitization projects expand their holdings, anyone who can access the web can read the records of intrepid explorers such as the scholarly Heinrich Barth or the noble Adolf F. A. Heinrich, Duke of Mecklenburg. Sites like openlibrary.org, archive.org, biodiversitylibrary.org and books.google.com, are giving conservationists new opportunities to put the records to use. It isn’t easy to know what an area looked like and which animals and plants were present 100 to 200 years ago. While pollen sample analysis gives some indication of plant communities, and an area’s oral tradition can be valuable, they are both incomplete pictures. Compared to oral accounts passed down through generations, historical travel records are generally more detailed, more reliable and easier to date. And historical images and descriptions have an impact and appeal lacking in most quantitative analyses. As a prime example, Scholte points to perceptions of human and elephant conflicts in Cameroon. For several decades many have believed Cameroon’s Waza-Logone was a region historically free of elephants. In the late 1940s elephants began to trickle into the area. By the 1990s Waza National Park held more than a thousand elephants. Excerpt from Heinrich Barth's Travels and Discoveries in North and Central Africa, published 1857. Demand for elephant tusks subsequently skyrocketed. By 1872 Gustav Nachtigal, a visitor to the area, wrote of the “brisk market for ivory” in Sahara and Sudan, Volume III: The Chad Basin and Baguirmi. Adolf Friedrich, the Duke of Mecklenburg, did not find any elephants on his journey through northern Cameroon in 1910 and 1911. Instead, he wrote of former elephant hunters who changed their lifestyle because the elephant population had dwindled. According to the old accounts, elephants belong in the area. But most elephants entering Waza-Logone are immigrants, said Scholte, pushed out of their former homelands by human activity. The disapperance of elephant habitat, and migration corridors, from the surrounding areas is the real predicament, Scholte said. Understanding what is behind the influx of elephants to Waza-Logone will, he hopes, encourage managers to find longer-term solutions than culling, such as landscape planning. In his position at Kitabi College of Conservation & Environmental Management, Scholte trains the conservationists employed by the Rwandan government. Until recently, their efforts to hold back liana — a long-stemmed, native vine — was proving a major headache. Many people blamed the expansion of liana on the local extinction of elephant and buffalo. However, even when these animals were present, liana still crawled all over Rwanda’s forests, as shown by early pictures and descriptions. It’s an idea, a good one, that has been suggested before, wrote Arend de Haas, conservation director for the African Conservation Foundation in an e-mail. The information, he said, allows conservationists to create a pre-colonial picture of African ecosystems, complete with vegetation cover and wildlife abundance. Scholte enjoys digitally leafing through old travel accounts, but along with exciting accounts of travelers like Henry Morton Stanley — who was said to have asked, “Dr. Livingston I presume?” — locating the scientific gems requires requires a lot of sifting. Some researchers may resist the idea of using travel descriptions as scientific sources. But the descriptions are by and large accurate, Scholte said. He considers photographs the most accurate, maps and drawings second. For written descriptions, he factors in how detailed the account is and if it agrees with other records. When the accounts are used along with other sources of information, they offer a fuller, more literary view. “In scientific work people don’t allow themselves much colorful, poetic description,” he said. Citation: “Using the past to manage for the future: Contributions of early travel literature, free online, to African historical ecology.” By Paul Scholte. African Journal of Ecology, Aug. 26, 2011.